From 11th to 15th July, Nantes − Saint Nazaire Port’s Louis Joubert sluice dock is the backdrop for some striking new scenes, with the loading of five 400-tonne offshore wind turbine nacelles aboard the Brave Tern, a jack-up vessel operated by the Norwegian shipping line Fred Olsen Wind Carrier. With this operation, an entire port-based logistics organization is taking up the challenge proposed by the rapid growth of the MRE sector on the Loire Estuary. As an industrial facility, Nantes − Saint Nazaire Port is providing its logistical and land support, with the deployment of the Louis Joubert sluice dock and one part of the future logistics hub for the storage of these oversized cargo consignments. The entire operation, including the in-factory loading by jacking and the storage of the cargo on the quay of the Louis Joubert sluice dock, has been orchestrated by OCTRA, the transport services and engineering provider specializing in the management of projects involving very heavy components. 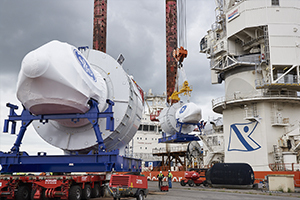 From departure from the General Electric factory at the Montoir de Bretagne port facility to arrival at the logistics hub which is the site of the Louis Joubert sluice dock, considerable resources were mobilized for the passage with absolute precision of extra-large-sized components measuring 10 metres high and 20 metres wide. A trailer was specially developed by OCTRA and Scales in order to cross the Pont du Brivet bridge. Atlantique Manutention, a company specializing in the handling of heavy-lift cargo consignments, was charged by OCTRA with carrying out the port-based operations. The services of 8 dockers were used for this unconventional operation. They received specific training beforehand for the purposes of the height work and the sling gear work on the nacelles. The ship’s agent services were provided by SOGEBRAS on behalf of Blue Water France. This configuration points to the scale of future activity represented by the construction of the wind farm off the cost of Saint Nazaire by the consortium led by EDF-EN and to the utilization of the logistics hub for the pre-assembly of the offshore wind turbine components by 2020. Currently being developed, the hub will eventually receive 80 nacelles, 240 blades and as many mast sections.